No matter how much you know about koi fish there are always more fun koi fish facts to be learned! There are so many interesting things to learn about koi fish that you should learn something new with these 15 fun koi fish facts. Koi fish are decedent's of the hardy Carp which is so adaptable it can be found all around the world. Koi fish were brought to the worlds attention after one was given to the Japanese emperor as a gift in 1914 to grace the imperial palaces mote. Koi fish and Goldfish are distant cousins as they both decent from Carp, but goldfish came about long before koi fish did. The largest koi fish ver recorded was a whooping four feet long and 91 pounds! The monster sized fish was later sold to the koi enthusiast Geoff Lawton where she received the name Big Girl. Koi fish can actually get sun burns so make sure they have some shade on sunny days! Koi fish not only look the best in a group they also enjoy having other koi fish around. Make sure to keep an eye out if you put any other types of fish in your pond though because koi have been known to bully non-koi pond mates. The oldest koi fish ever was a koi named Hanako was born in 1791 and didn't die until 1977 that means she lived to be 226! There are 24 koi fish varieties and counting. A new koi fish variety could be presented at any time but for now there are the Kohaku, Taisho Sanke, Showa Sanshoku, Tancho, Shiro Utsuri, Hi Utsuri, Ki Utsuri, Asagi, Shusui, Matsuba, Platinum Ogon, Yamabuki Ogon, Kujaku, Hariwake, Kikusui, Kumonryu, Beni Kumonryu, Chagoi, Soragoi, Ochiba Shigure,Goromo, Goshiki, Kikokuryu, and the Kin Kikokuryu. Koi fish's brilliant colors make it harder for them to survive because it attracts predators such as cats, birds of prey, and raccoons. 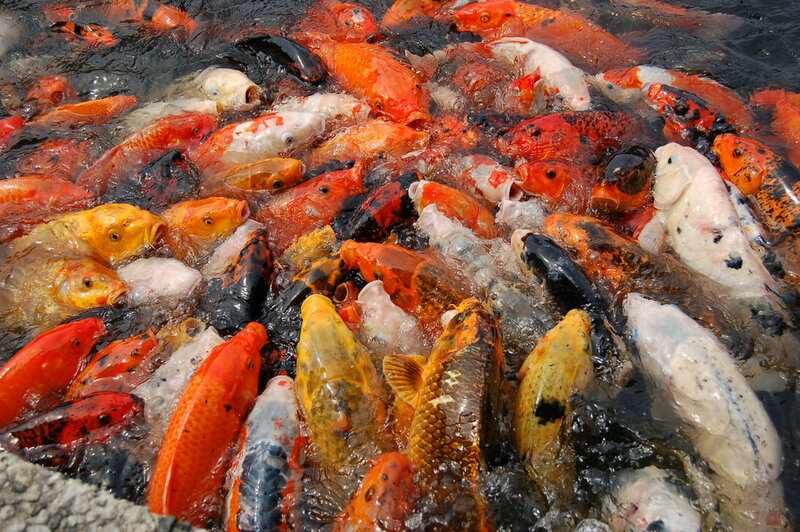 Female koi fish can lay as many as 50,000 eggs during one breeding season of which half will hatch if not tended to. That is a lot of baby fish! Did you learn something new from our fun koi fish facts? Can you think of any other fun koi fish facts we should add to our list? Leave them in the comments below we love to hear from you! Oct 12 Shusui Koi Fish: What Sets Them Apart from Other Koi?